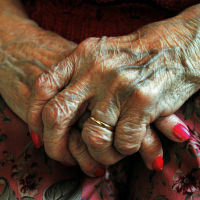 The coming eight years could see a drastic rise in the number of older people facing chronic conditions and disabilities, a report has suggested. By 2025, it is feared that as many as 2.8 million people over 65 could require care across England and Wales. That would represent a 25% rise since 2015. In a bid to mitigate this, scientists are now calling on policy-makers to encourage better diets, reduced alcohol consumption and reduced smoking rates, while targeting high blood pressure and a lack of physical exercise. The authors of the new study, which is published in the Lancet Public Health journal, also say the social care system needs to be improved. Lead researcher Dr Maria Guzman-Castillo from the University of Liverpool said: "The societal, economic, and public health implications of our predictions are substantial. In particular, our findings draw attention to the scale of societal costs associated with disability in the coming decade. "Spending on long-term care will need to increase considerably by 2025, which has serious implications for a cash strapped and overburdened National Health Service and an under-resourced social care system. "More cost-effective health and social care provision will be needed, such as increased availability of institutional care, and better financial support - such as tax allowances or cash benefits - for family members providing informal and home care." Many people face physical impairments during later life. But that doesn't have to prevent them from taking holidays and seeing the world. That's because specialist seniors travel insurance is available for retirees, covering things like medical costs. The latest piece of research suggests dementia could become the biggest disability threat in the coming few years, with the rate due to climb by 49% among people who are aged 65 and over. By the time 2025 comes around, it is thought that roughly 699,000 people across England and Wales might have dementia care needs, compared with 468,000 back in 2015. Meanwhile, the researchers forecast that mental health problems, diabetes and musculo-skeletal disorders could increase by 37%.